Indonesia celebrates Independence Day on the 17th August. 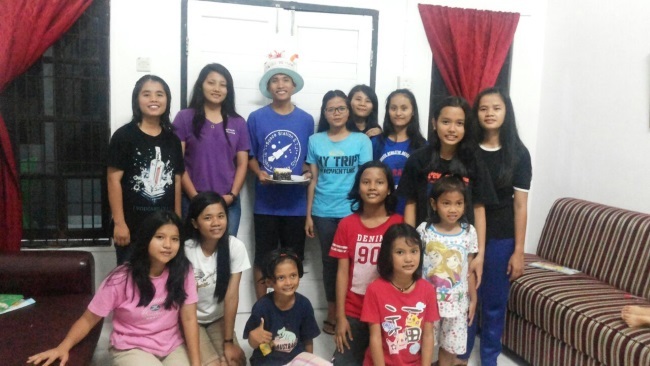 Here are some of the YACAN girls with Ibu Iin, and Ibu Mena and some children at Deli Tua during the celebrations. Here are the YACAN teachers - from left; Oscar, Patricia, Aldi, Messy, Febri, Sonya, Saut, Iin, & Aldo. As the new school term commences,YACAN have bought all the children new books for the academic year with money supplied by BEATS. Here are some of the children with their new resources. 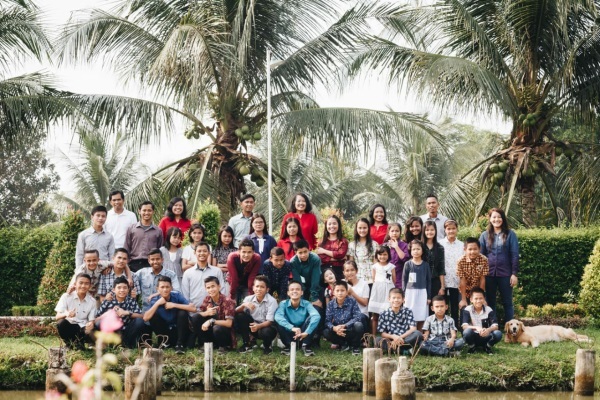 YACAN children's home, Deli Tua, Medan, Indonesia, is a Christian home, currently housing 34 children, most of whom are earthquake and tsunami victims. 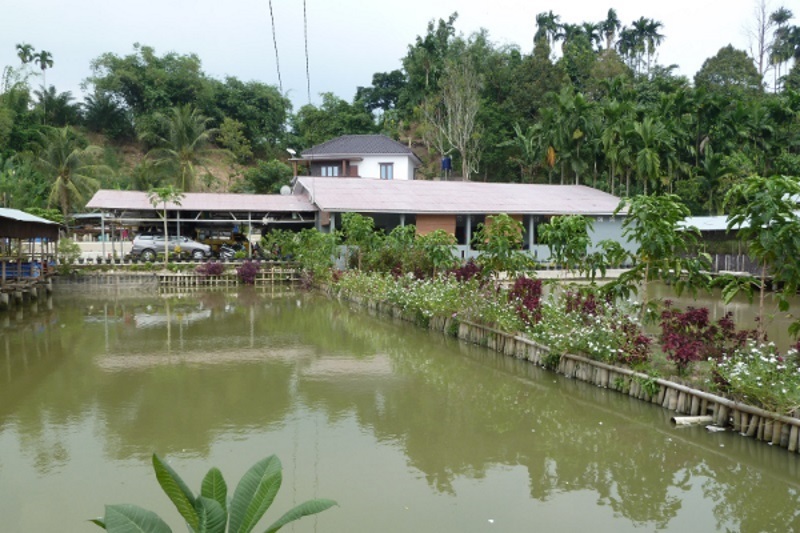 The home is purpose built, and includes a fish farm and areas to grow fruit and food in order to be as self sufficient as possible. The Elementary School aged children are taught by the staff and older students, they have rented a building a short distance from the home to use as a school, seen here below as the children arrive for their lessons. Some of the High School children travel to the YASAH school (see YASAH page) each day; BEATS provided funds for a replacement vehicle for this purpose (see below). A house has been purchased for the older students who are attending university. This is enabling them to start learning to be independent, whilst they study at university. One of our team members is staying with them at the house. January 2016. BEATS have supplied funds to YACAN for a new vehicle for transporting the children to and from school. The old vehicle was over 20 years old and in a poor state of repair. BEATS have also provided funds for a new laptop and a motorcycle. The photographs below show these items and some of the children in the new vehicle on the morning school run. SPONSOR A CHILD at YACAN children's home for £30 per month (or less). 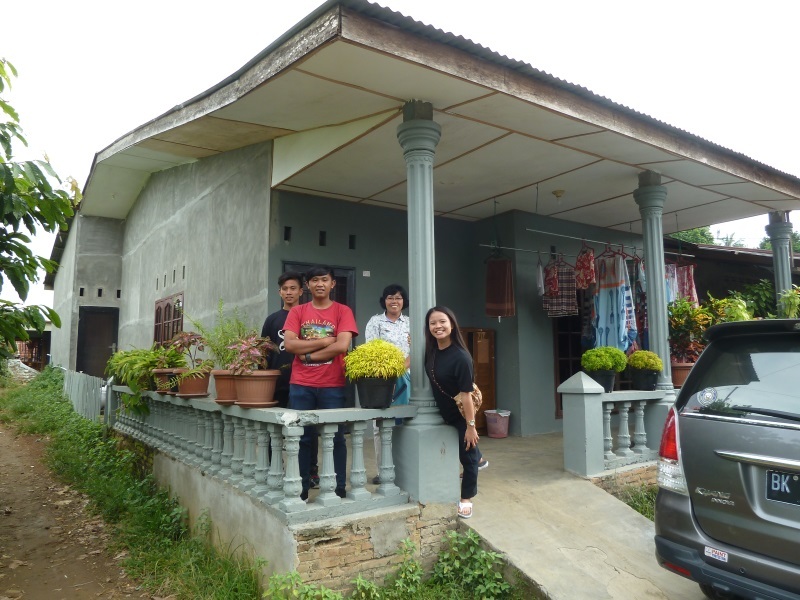 The staff at YACAN children's home need financial support - Contact Us to set up a regular donation; in this way you will be supporting this valuable work. R was 6 and has a Mum and an older brother (11). 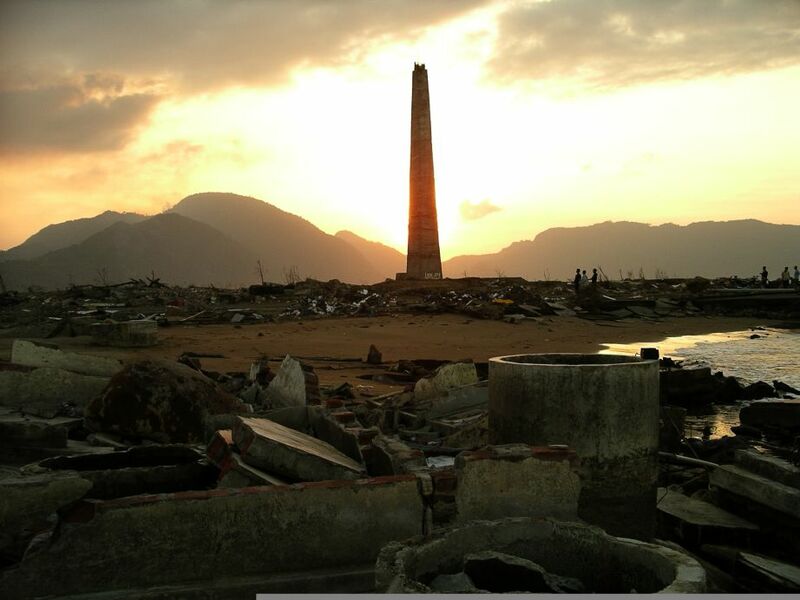 Her father and three siblings died in the tsunami and they also lost their house. They are now living in another village. They were floating in the water and were rescued by others. They still have nightmares and are scared of heavy rain, thunder, strong wind etc. and R does not like being in the house alone. However it is a comfort living in a village of people with similar experiences. 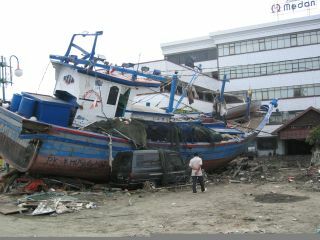 The mum cried while talking to us, R said she does not discuss the tsunami with friends. 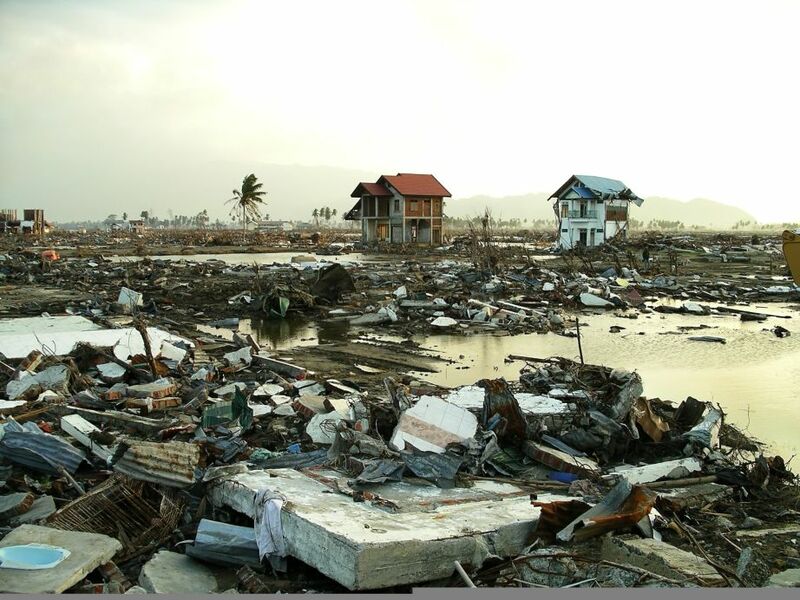 Y and E: Y's mother and 2 brothers were killed in the tsunami. Her smaller brother was holding E's ankle, while E held onto a tree, but lost his grip as they were both swept along. Y's mother went to find the older brother; Y never saw her again. She now lives with her Aunt. R and his sister S lived with their family close to the water. They had been sent to their uncle's house for the night so they did not annoy their older siblings. Their uncle told us he had to choose whether to try and get to R & S's family or save his own. None of R & S's family survived. F & M: F stayed on the roof opposite her grandmother's house all day. She & M were reunited that evening and were told that both their parents had died. Their parents were near where the mass grave is now situated. 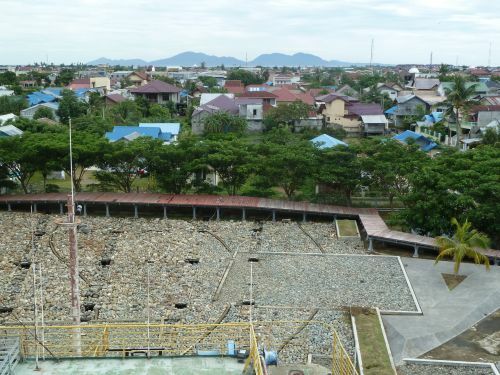 M was at the main mosque when the tsunami occurred; he dreams about his parents. 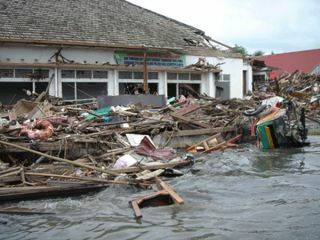 Approximately 1,000 NGOs (Non-Government Organisations) went to Banda Aceh and helped with emergency aid, clearing up & rebuilding. Most have now left; BEATS is continuing to support orphaned children who are living with relatives. The State Governors have expressed their gratitude for all the assistance rendered, by erecting monuments thanking all the countries that came to their aid. The Central Park has a tear drop shaped plaque for each country, like the United Kingdom shown here. 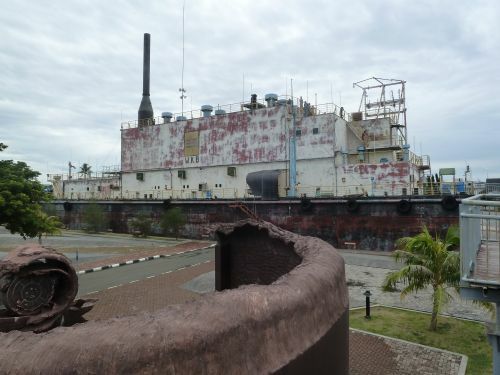 This Generator Barge was washed approximately 2 miles inland by the tsunami; it has now been converted into a tourist attraction. The photo below was taken from it looking back towards the coast; the sea can just be seen in front of the distant hills. 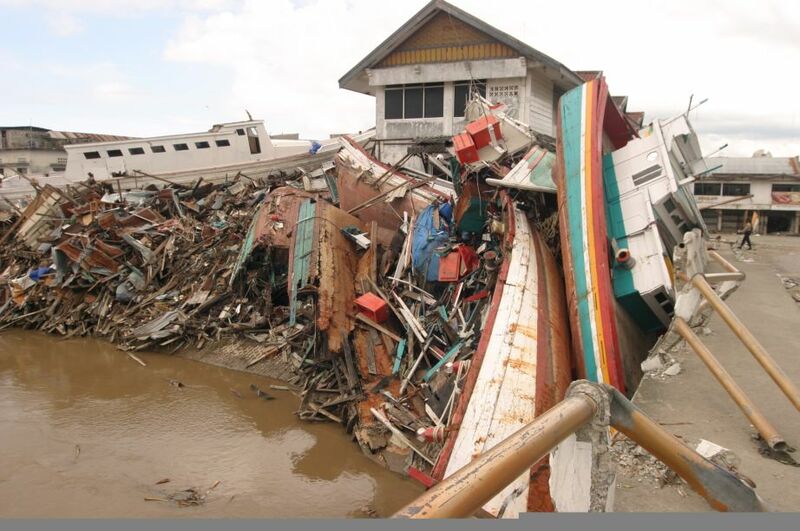 All the buildings seen have been built since the tsunami, apart from a few wrecked buildings left as a testament to the destructive power of the sea. 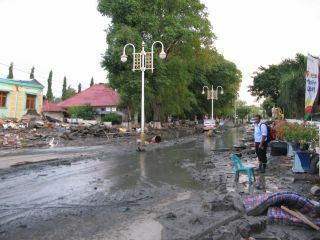 One of the reasons the tsunami caused the deaths of so many people both in Aceh and in other countries was the lack of any advance warning. DART buoys have now been installed out in the Indian Ocean which monitor the movement of water in order to give a vital warning should a similar situation develop. 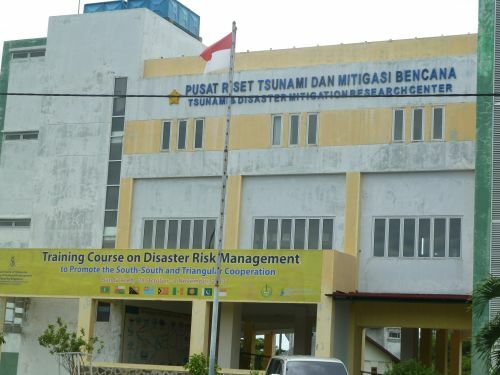 A tsunami disaster research facility has been built in Aceh so that in the future more will be known about them and how to respond better when such emergencies arise.